Real GDP is expected to grow by 1.8% in 2017, following a gain of 1.3% in 2016. Real growth of private final consumption was 1.8% in 2016 and an increase of 1.5% is predicted for 2017. Annual disposable income per capita totaled CAD31,797 (USD23,990) in 2016, with projected growth by 0.2% in real terms in 2017. Over 2016-2030, total disposable income is forecast to grow at an average annual rate of 2.0%. In additional to only modest GDP growth, Canada’s population growth continues to decelerate. Immigration accounts for more than 50% of Canada’s population gains and will be responsible for virtually all growth in the labour force in the future. The income gaps between recent immigrants and Canadian-born remain on the agenda, with recent immigrants found among the groups with high risks of low incomes. Slow GDP and population growth, along with the lack of significant unmet potential in the country, have played and will continue to play a role in shaping the demand for tissue products as well as product development and marketing strategies. In 2016, retail tissue posted volume growth of under 1% to reach 486,000 tonnes. Most product categories within retail tissue in Canada are seen by consumers as non-discretionary staples, which supports the demand. However, the market has been facing demographic headwinds, including falling birth rates and slow population growth. Volume growth in retail tissue in Canada is being mainly driven by the population growth, as the market is already saturated. Annual per capita usage of retail tissue products in Canada is 13.5kg, one of the highest in the world. Overall, retail tissue has very limited room for higher per capita volume growth rate without meaningful innovation to stimulate consumer demand. Retail tissue is seen by most Canadians as commoditized products, with little differentiation between various brands. The constant promotion activities, along with slow economic and GDP growth, have also encouraged consumers to become more price sensitive and seek out products and brands with discount offers. The price elasticity is very high in retail tissue, and most consumers do not show a high degree of brand loyalty. 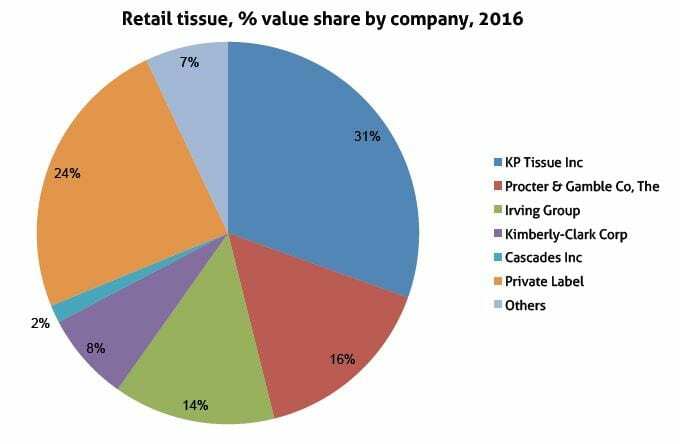 This tendency, along with product quality and innovation, also explains a relatively strong presence of private label in retail tissue in Canada, generating a value share of 24% in 2016. Amid the conditions of slow volume demand and pricing pressures, margins remain slim for brand owners that have been looking for a balance between pricing and cost inflation to protect profit margins without losing market share. Tissue manufacturers are incentivised to focus on the development of premium products to improve margins, while at the same time, however, looking for ways to offer value for money to price sensitive consumers. The main focus has been on offering premium textures and ‘mega rolls’, with the latter especially notable in toilet paper. Procter & Gamble, for instance, offers mega rolls which are four times the size of regular rolls of toilet paper under the Charmin brand, with an emphasis on a washcloth-like texture, which provides extra softness and strength. Kimberly-Clark, meanwhile, recently introduced the mega rolls format under its brand Cottonelle, continuing to focus on its CleanRipple texture as the products’ main selling point. Domestic manufacturer KP Tissue is promoting 3-ply toilet paper instead under the Cashmere brand, emphasising its soft and luxurious texture. Seeking other ways to differentiate its products and offer new solutions to consumers is KP Tissue with the launch of SpongeTowels Minis, the first paper towel in compact format in Canada. This new miniature format is designed for urban dwellers who have limited storage space. Higher value category opportunities – moist toilet wipes? With very minimal growth in retail tissue and low profit margins, tissue manufacturers have been investing in moist toilet wipes. Manufacturers are making efforts to promote these products and educate consumers on their benefits to bring about a shift in the prevailing consumer mindset. Major brands in the category position their products as complementary to dry toilet paper, while some of them directly market the benefits of moist toilet wipes on the packaging of dry toilet paper. However, sales of moist toilet wipes have not taken off yet mainly because Canadian consumers are still relatively conservative and generally reluctant to make a significant change in their toilet habits. With estimated unmet potential at about 81,000 tonnes and potential incremental sales of USD288 million, the Canadian market is expected to continue to see slow growth ahead. 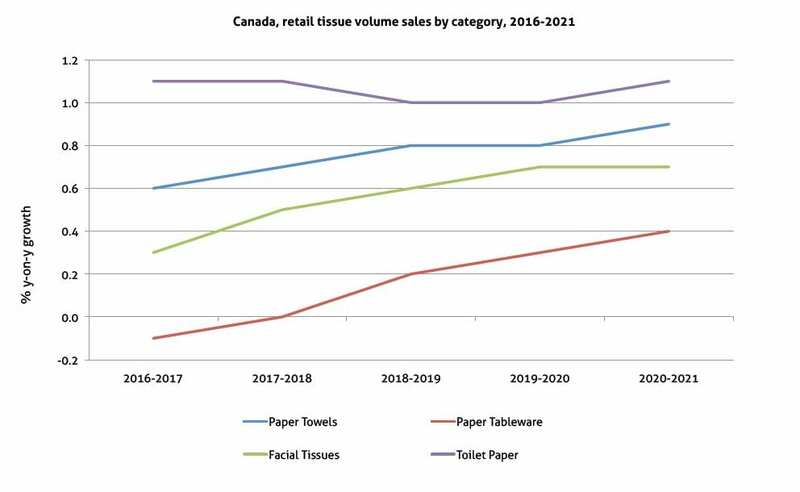 Over 2016-2021, retail tissue sales in Canada are expected to increase at a 1% CAGR in volume terms. Population and GDP growth will remain the key drivers of growth, and pricing pressure will remain a factor. These tendencies will once again highlight the need for innovation that combines quality and the right price while at the same time emphasizing the need for cost efficiencies on the part of the suppliers and manufacturers. Share the post "Canadian tissue marketplace continues to battle soft demand"